You are currently browsing the archives for the tag 'renzo rosso'. Haute Couture or Hate Couture? 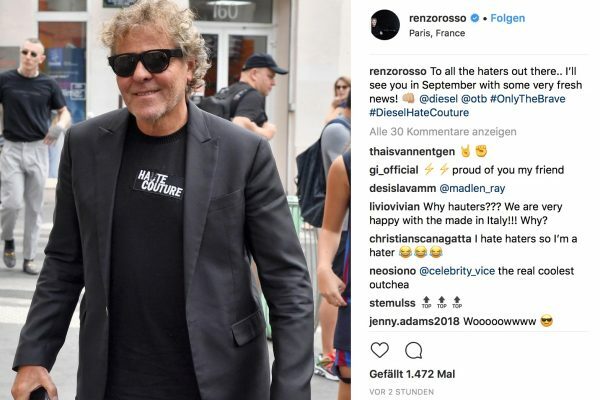 Yesterday, Italian fashion entrepreneur, also called the «Jeans Genius», Renzo Rosso, was spotted during Paris Haute Couture Week wearing a T-shirt with cryptic wording on it. A mistake, or a purposeful provocation? It was both—a mistake on purpose. 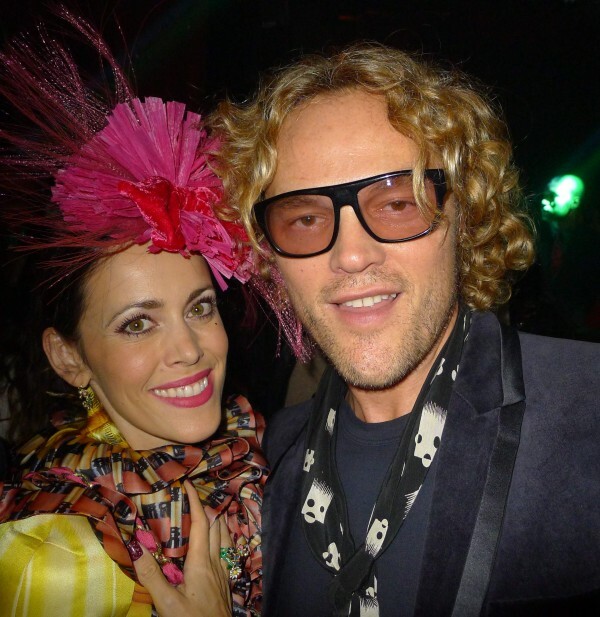 Me with Renzo Rosso at Viktor & Rolf’s Flowerbombastic Party during Paris Couture Week. 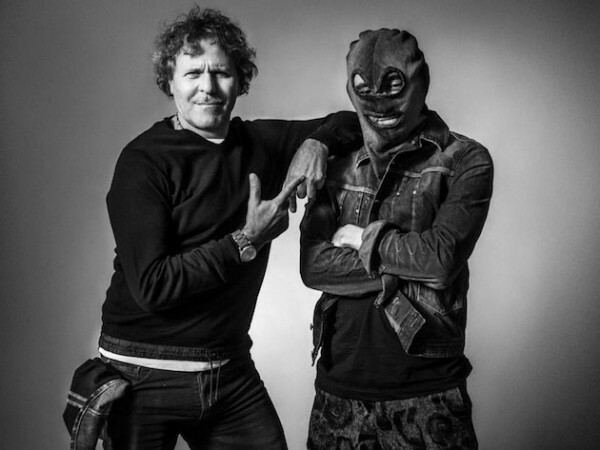 DIESEL founder Rosso definitely doesn’t make a mistake. This move is a marketing strategy par excellence. The President of OTB Group, the parent company of Diesel, Maison Margiela, Marni, Paula Cademartori, Viktor & Rolf, Staff International (manufacturer and distributor of DSquared², Just Cavalli, Maison Margiela, Marni and Vivienne Westwood), and Brave Kid (manufacturer and distributor of Diesel Kid, Dsquared², John Galliano Kids, Marni and Trussardi Junior) knows how to get attention and make a statement in the right way. Anything you do online, whether you are famous or not, will get judged. Hate brews on the internet; angry, bitter people are able to hide behind the anonymity of their screens. At one point or another, everybody receives hate on social media. He wanted to provoke his audience with an intentional misspelling in public and on Instagram. As expected, tons of comments appeared in his feed over the next few hours, giving more proof that conflict and hate are inescapable online. DIESEL once again taps into current social issues in a very personal way, starting with self-mocking. 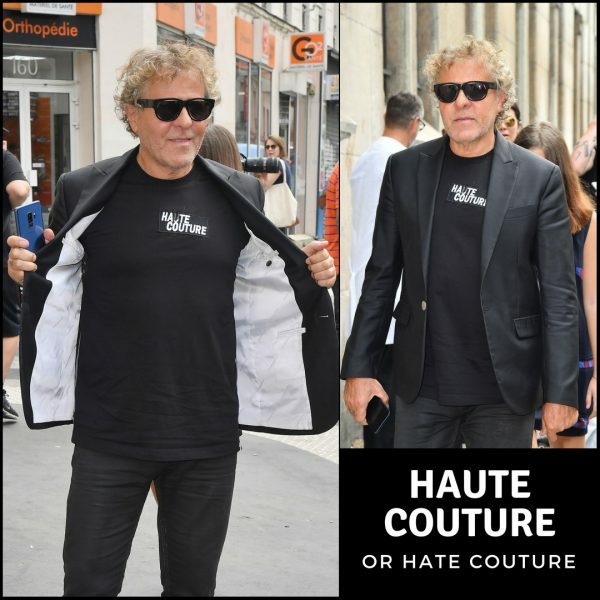 The brand’s Haute Couture will be a bold message towards haters worldwide—and an invitation for everyone to step up, face and own the negative messages we receive every day. The complete reveal of this new communication ‘adventure’ will occur at the end of summer—so, now more than ever, stay tuned. Bravo! In the meantime, I will be on vacation wearing this shirt :-). Ten years ago, Viktor Horsting & Rolf Snoeren wished upon a star. 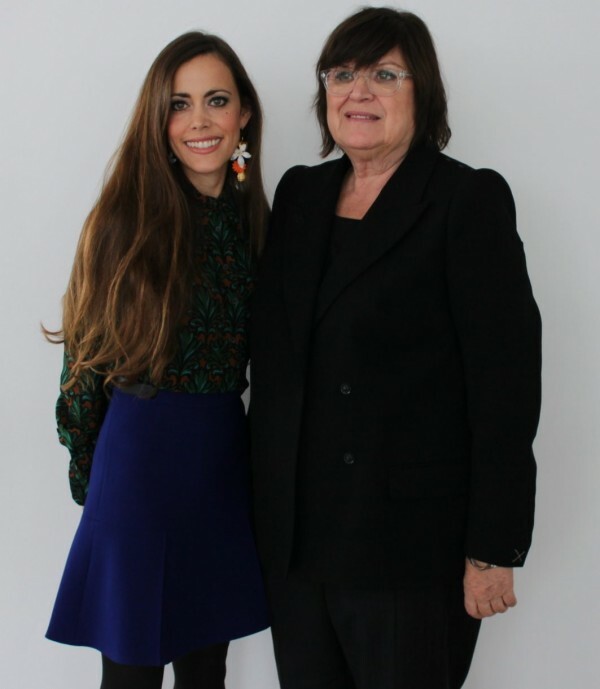 Their wish was to create a fragrance that would make the world a better place. 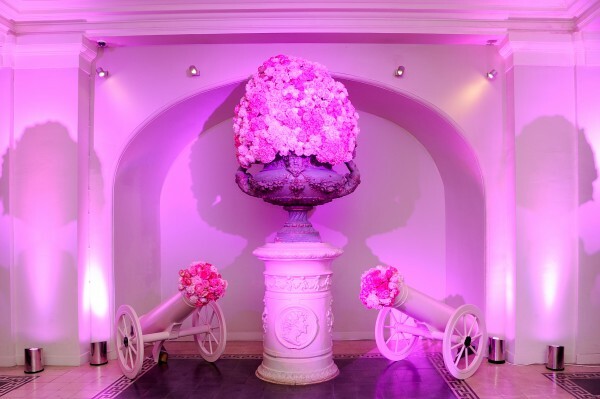 Their wish came true and with Flowerbomb another success story of the avant-garde Dutch fashion house was born. The sun is shining in Paris. It is the morning after the 10-year anniversary party of Viktor & Rolf’s highly succesful fragrance «Flowerbomb» and the day after their latest Haute Couture fashion show. Even I feel a little tired because of all the great impressions from yesterday. Yet, I am full of energy and excited to meet the designer duo in person. 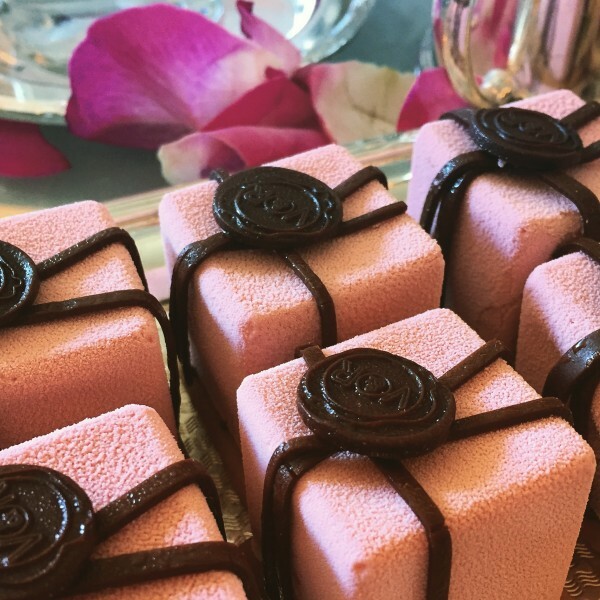 I wear a silk top and skirt with bow embellishments from one of their previous collections (for the outfit post, click here please) and when I enter the suite at the Peninsula hotel, they recognize it in a second and I am greeted with two big smiles. My first impression? As trivial as it sounds, I like them immediately. Fashion and fragrances, both are about fantasy and the designer duo knows exactly how to cater to that. In an intellectual, yet theatrical way, I am immeditaley transported into their world. But who are those two Dutch men that would like to make the world a better place with their creations? Their vita reads like a bedtime story, like twins who were seperated by birth and found themselves at a later stage in life. Both were born in 1969 not far away from each other. They met during their studies at the Arnhem Academy of Art and Design and began working together upon graduation. In 1993, they won a talent contest and launched their namesake label. First, their creations were presented in art galleries until they showed their first Haute Couture show in 1998, followed by their ready-to-wear collections in 2000. In 2006, H&M worked with the avant-garde pair for the at that point only third of the mass-retailers designer collaborations. Many more were about to follow, such as a luggage range for Samsonite, a reinterpretation of the Piper-Heidsieck champagne bottle (they turned it upside down and labeled it pink) and a line of false couture lashes for Shu Uemura. Just to name a few. 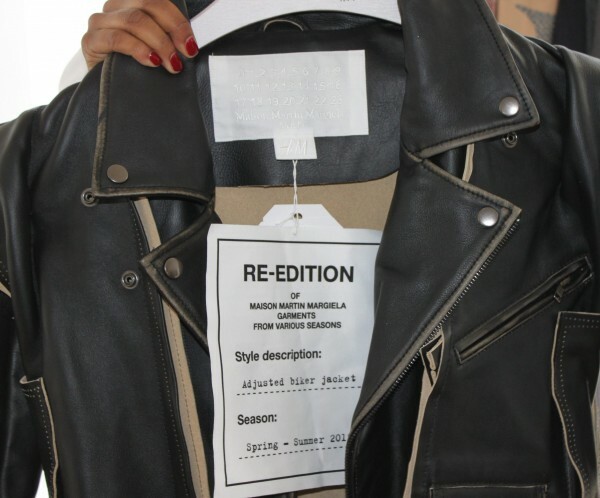 In 2008 Italian clothing magnate Renzo Rosso, President of OTB Group, the holding group of Maison Martin Margiela,, Marni and Diesel, bought a controlling interest in the company which gave Horsting & Snoeren the possibilty to create pre-collections and catwalk shows that kept the label on everyone’s lips. 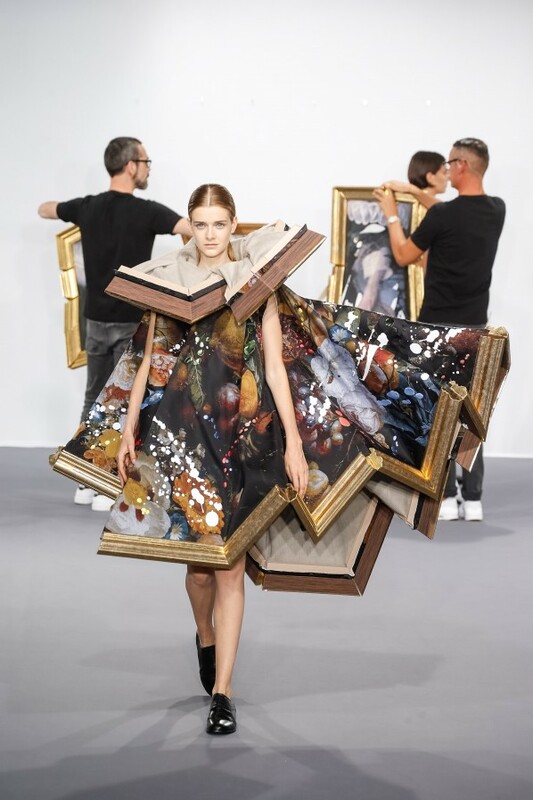 This fall, Viktor & Rolf will take a break from the ready-to wear schedule after their F/W 2015 presentation to focus on their couture line which is every season a creative atomic bomb. 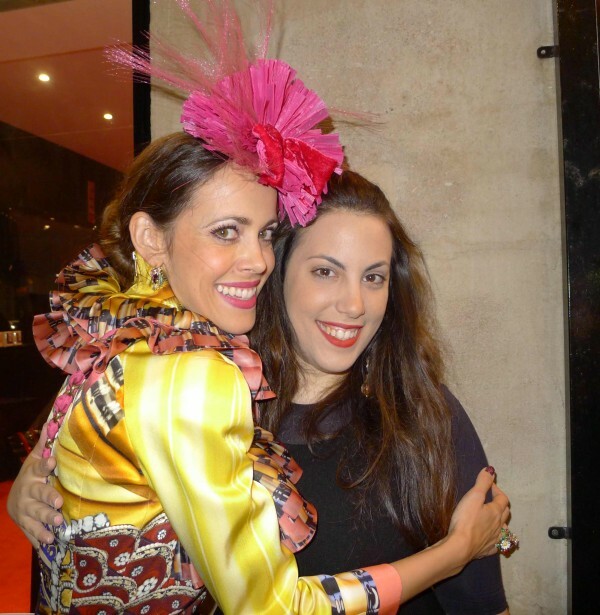 The day before the interview, they had presented their so-called «Wearable Art» F/W 2015 Haute Couture collection at the mezzanine space of Palais de Tokyo. During the show, the designer duo interacted on stage by taking broken picture frames filled with fabric of a wall and transforming them into gowns that they draped over the models. Ten years ago, another artistic runway presentation had taken place. 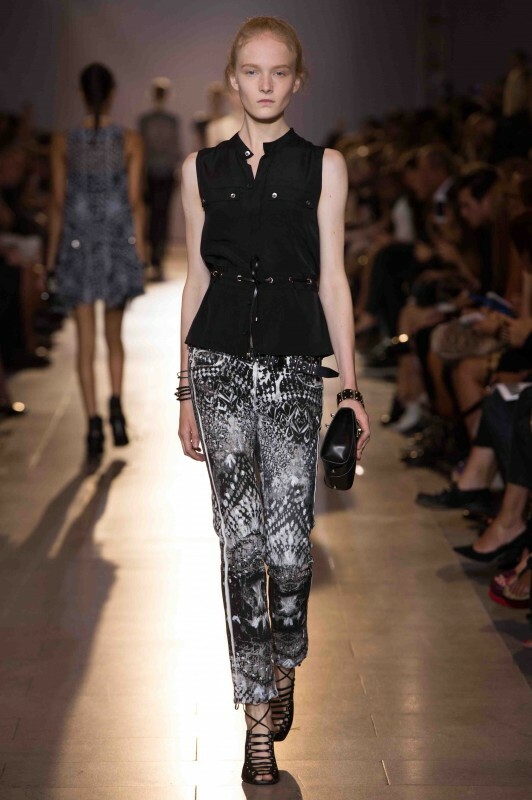 With three whispering words at the mid-point of the S/S 2015 ready-to-wear show featuring a collection rendered in black and dark tones – «Flowerbomb, Flowerbomb, Flowerbomb» – the stage revolved, revealing a completely transformed tableau vivant of models in a palette of pinks, roses and creams. It was a defining moment for Viktor & Rolf to launch their first female fragrance and intricately linking it to their powerful fashion collections – both a symbol of transformation and empowerment. F/W 2015 will be your last ready-to-wear collection because you would like to concentrate on couture. Why is that? V&R: It was an artistic decision. We started to show couture in the beginning of our career and we returned to it for our twentieth anniversary two and a half years ago. This is what we really love so we want to focus on it. The great thing about couture is that you can take it to the extreme. It is like poetry for ideas. 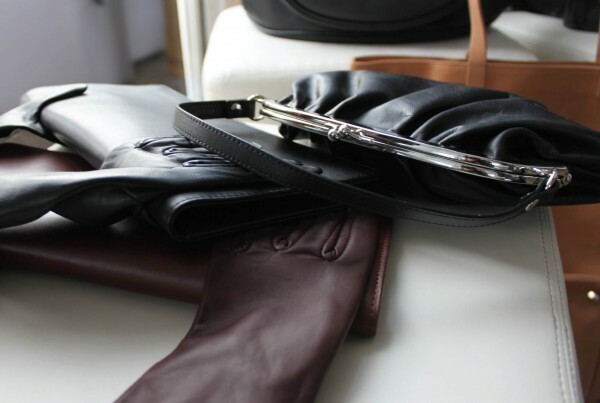 It gives us more freedom as the fashion system can be very demanding. Will couture influence your fragrance line? It seems rather obvious that you would enter the world of Haute Perfumery as a next step. V&R(Both smile): Kind of the next project. It is too early now to speak about it. 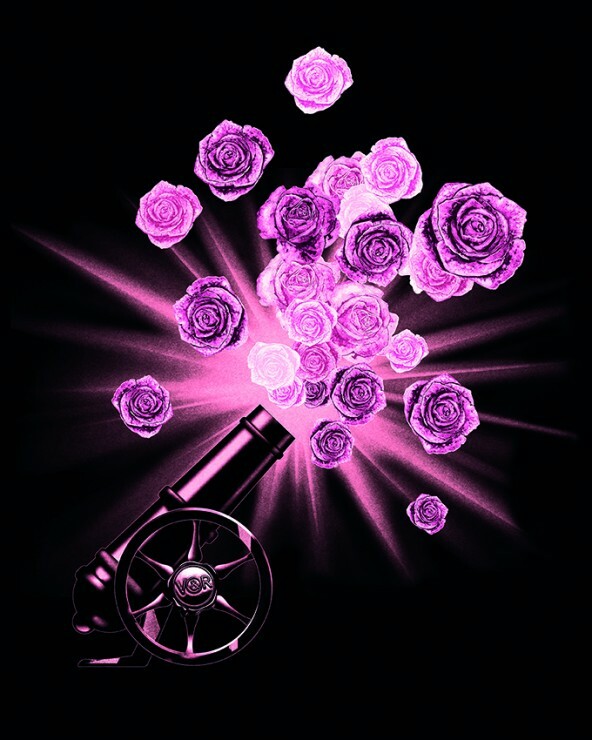 How did the «Flowerbomb» project get started? Were you approached by L’Oréal or vice versa? V&R: L’Oréal came to us. They recognized the storyteller in us. We dreamt of a fragrance that had the power to spread a positive message. 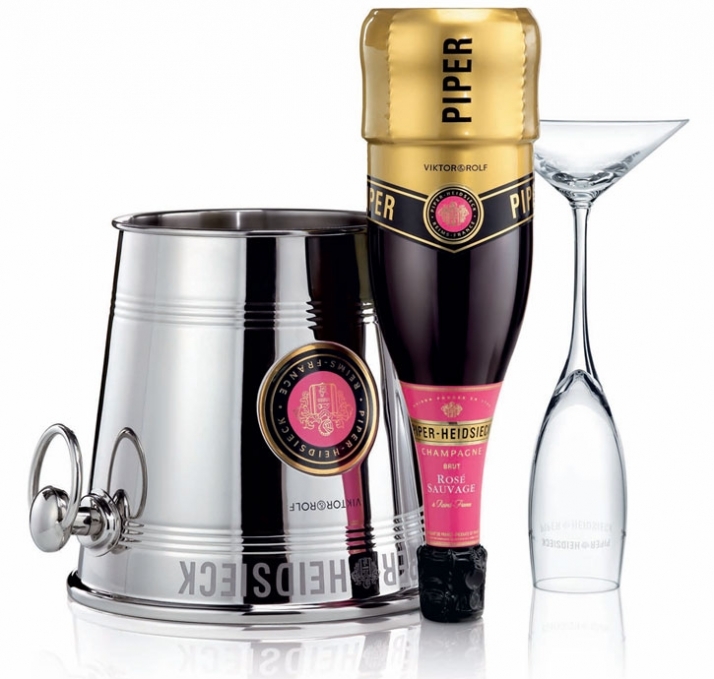 «Flowerbomb», that is very innovative in its gourmand approach, was created by Oliver Polge, Carlos Benaim and Domitille Bertier. How were you involved in the process of making your first fragrance? 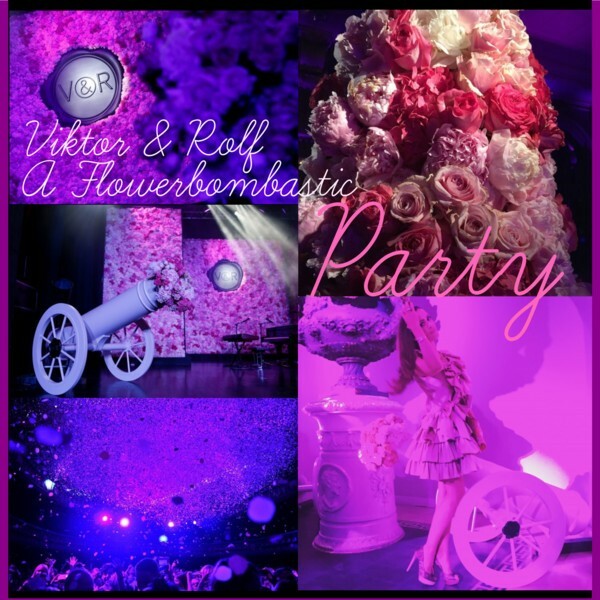 V&R: Well, it started with the word «Flowerbomb». That was our idea because we are very drawn to flowers. It becomes easily just pretty. The name is about opposites that attract. Opposites that create something new when put together in an unexpected way. A perfumer is an artist in its own. When we smelled it first, we knew that is it. In 1996, we already had done an art project in a gallery. At that time, we didn’t have a career yet just big dreams so we visualized our ambitions in small installations with dolls. There was for instance a doll in a photo studio or a shop. A fake perfume was also part of the exhibition because we thought it would be great to have our own scent. It was made in a limited edition of 250 and you couldn’t open the bottle. It was sealed so that its smell stayed a mystery. Everything showed our desire and ambition to be a designer. What does perfume mean to you? 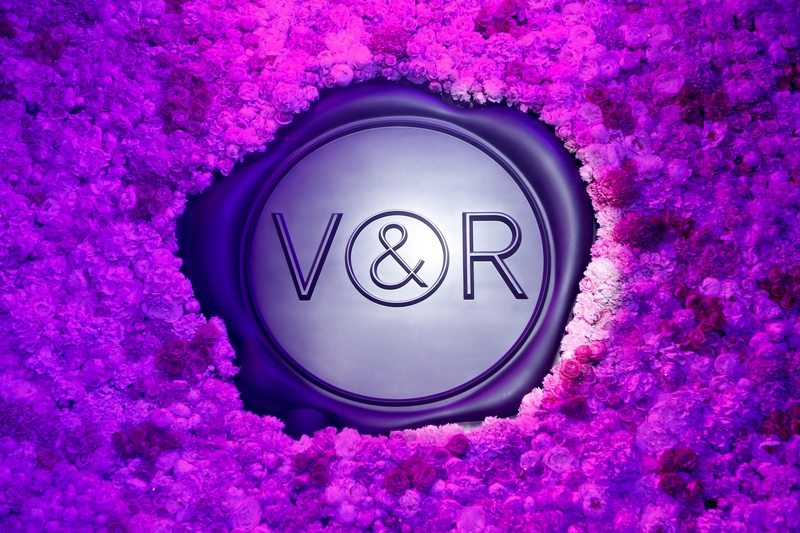 V&R: It’s a very direct and tangible way to express an emotion. And that is the challenge to create a perfume, to do it in a good way. To be clear. You have a name, an image, a bottle, a fragrance, a message you sent. So you have to get all those factors right in the beginning. 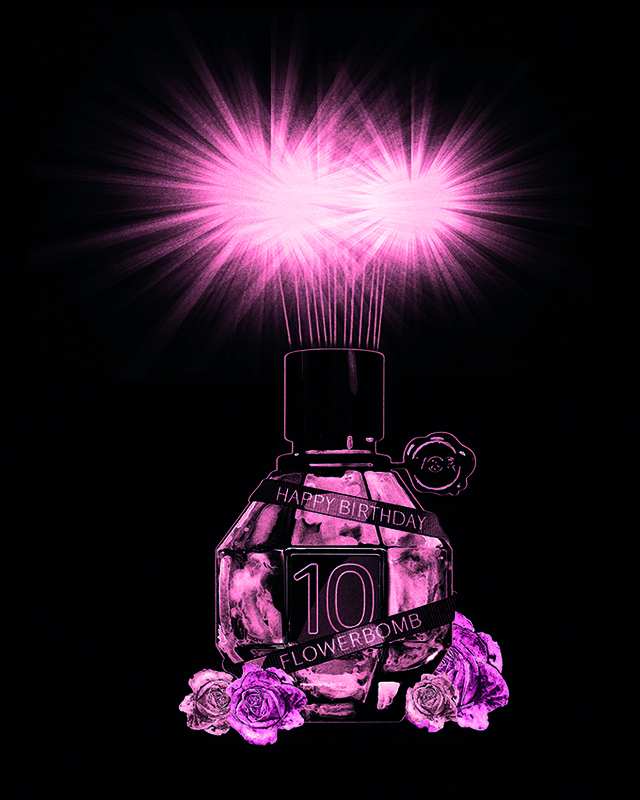 When you smell a woman wearing «Flowerbomb», how is that for you? Viktor: Sometimes it is weird when you see somebody in the street wearing «Flowerbomb» or «Spicebomb», our male fragrance. It almost feels like borderline and inappropriate as if you know something about this person you shouldn’t know. Rolf: I always want to see who wears it when I smell it. The ad campaign was created together with your friends, the famous photographer duo Inez van Lambsweerde & Vinoodh Matadin. It hasn’t been changed for a decade. 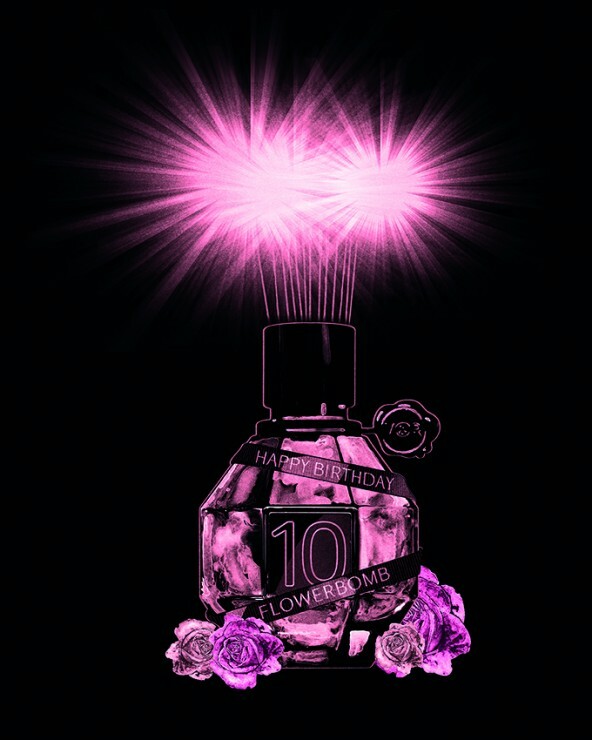 Couldn’t you imagine a famous face for «Flowerbomb» as most of the fragrance houses do? Not so easily. What we like about the ad is that it is a mystery. 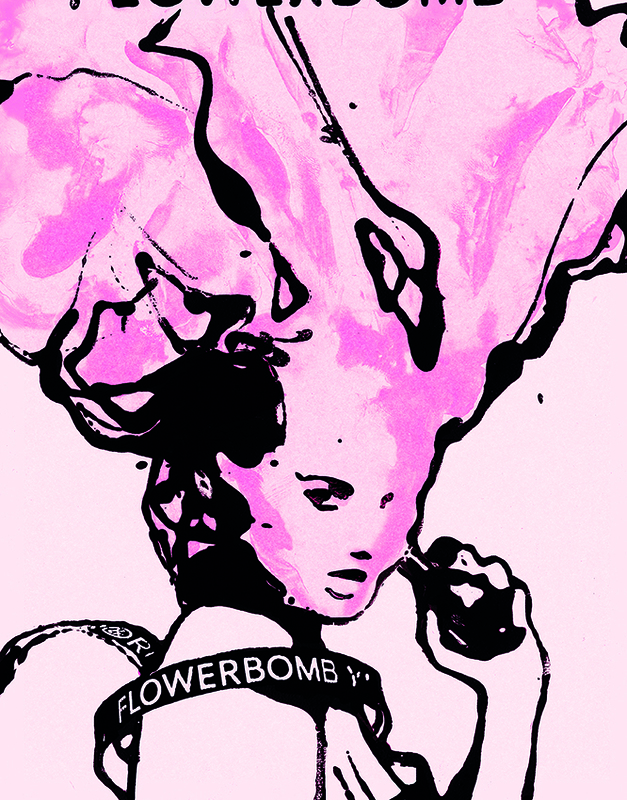 It is about the story of «Flowerbomb», the emotion, the feeling and not about one woman. It is about an idea, not about a celebrity and wanting to be that celebrity. It is aspirational in a different way. 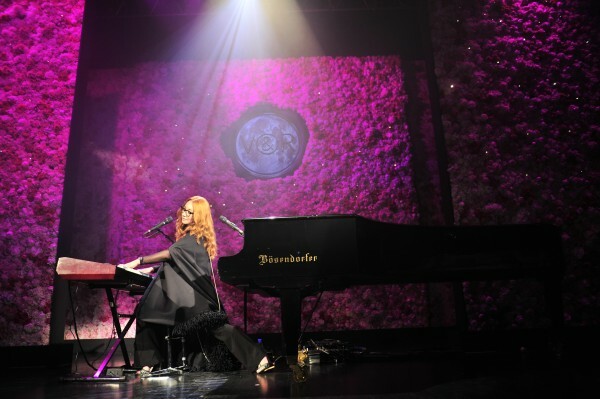 Tori Amos on stage at the 10-year anniversary party of Flowerbomb. 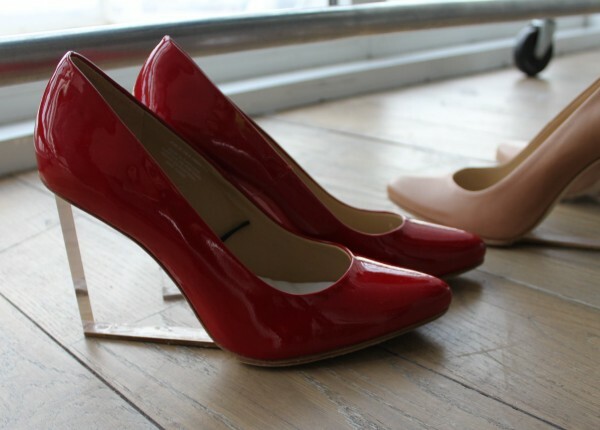 Do you have a woman in mind you would love to dress? 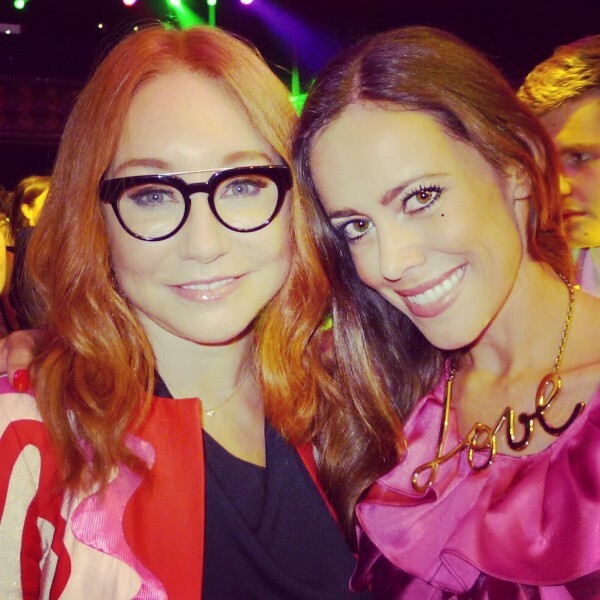 Rolf: Yesterday, hearing Tori Amos sing «Wishing Upon a Star» in our couture cape from the Zen collection a few years ago was a dream come true. She is a real «Flowerbomb». Viktor: I would agree, we dressed many celebrities. But with Tori a personal relationship has evolved over the years and that adds a meaning to the dressing. How can I imagine your creative process? It is a constant discussion. We whats up from the moment we wake up. It is very continious, one thing informs the other. Right from the start already, we felt that our work flow went really well. We had a conversation 23 years ago and it is still ongoing. Literally we start with words, then come up with ideas. We have to make it very clear and visualize it before actually getting started. You always seem to be in line. Do you ever fight or argue? V&R (Both laugh): Not so much. It is very easy. If we disagree in work, we talk about it and it means to us it is not finished. What do you admire about each other? Rolf: He is my best friend. I cannot really decribe it and I don’t want to because he means everything to me. Viktor: That is very sweet. Thank you! It would be diminishing to put it into words but Rolf you are a genius. That is it for starters. If you are in a relationship. How do your partners cope with the strong bond you are having? V&R: If there is a partner, it is a given. They know from the beginning how close we are. 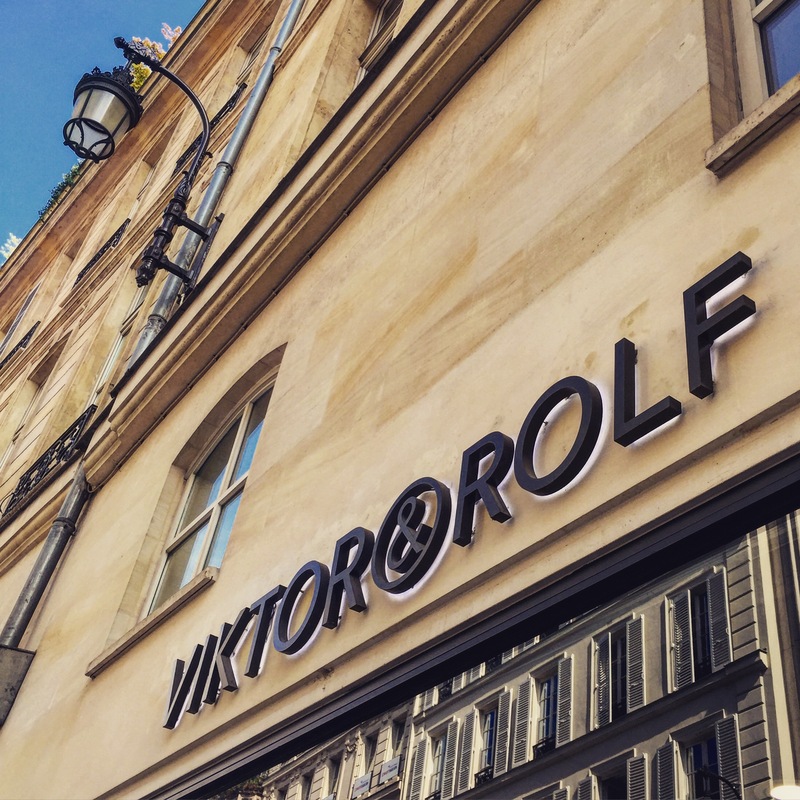 Viktor & Rolf’s Paris store is located at 370 rue Saint-Honoré. You seem to wear similiar outfits a lot of times. Do you whats up each other in the morning what you are going to wear? V&R (Both laugh): It used to be but not so much anymore. It is more about the same style. Do you wear other designers? V&R: Not really other designers. Mainly our own things or things that we don’t make like a Nike sneakers. Which scent are you both wearing? V&R: Spicebomb in the extreme version. How do you get creative? V&R: We talk a lot, it doesn’t always come easily. Sometimes you have to force yourself to sit down. just work and pull it out of yourself. Getting a deadline helps a lot though. 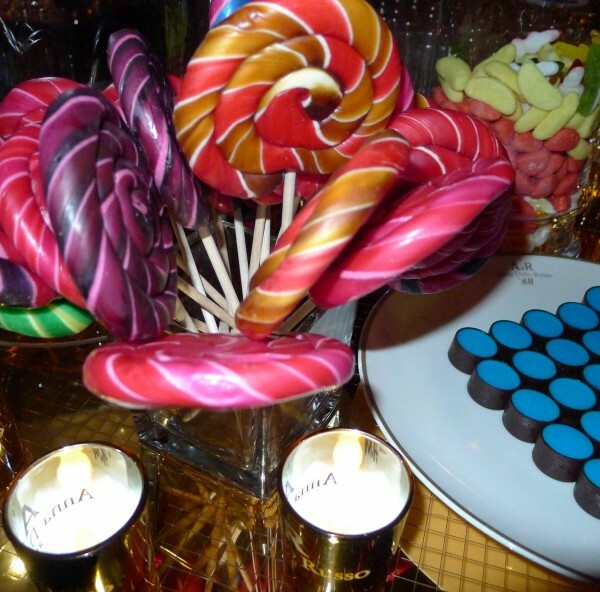 Viktor & Rolf sweets during the interview. In our times, being in business for 10 years is an amazing success for a scent. Do you see your fragrance line in collaboration with L’Oréal as a marketing tool? V&R: Oh yes, in our times, when everything is so disposable, it is amazing to have something that has a meaning. Especially considering the fact that when we started making it, we weren’t thinking of other people. We wanted something that we are prone to, that is important to us. 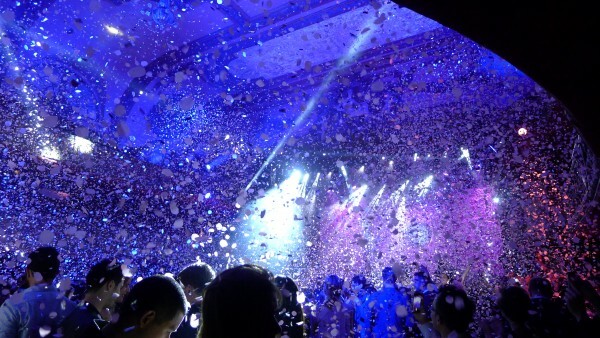 That it became such a success, is just amazing. What do you think about social media and its fastness? We are very ambivalent. Thinking of how we grew up in the Netherlands, there was not a lot of fashion. It is great how up-to-date and connected the kids of today are. At the same time it looses mystery, and it becomes so disposible, but we use for example Instagram. For our last couture show we tried to make images that didn’t exist before. Do you manage your own instagram account? We have an assistant with whom we do it together but we look at it as well. What are you most proud of in terms of your career? Is there a collection that you are most proud of? V&R: Several ones, but the last couture show was for us an achievement, as we tried to get to the essence of our work, who we really are. Viktor & Rolf. The brand in 3 words. Viktor(smiles): Can it be six? Provocative couture. Unexpected elegance. Conceptual glamour. These are the creative pillars that define the avant-garde house of Viktor & Rolf. 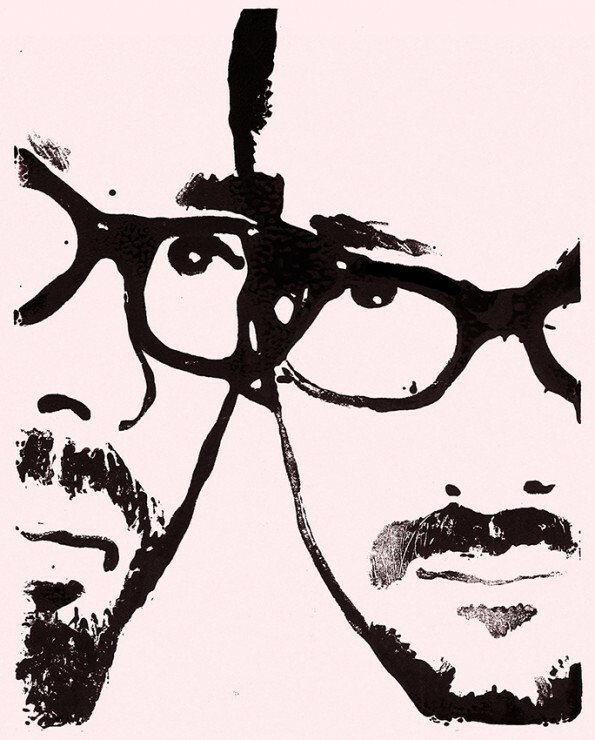 Thank you, Viktor & Rolf for this amazing interview! A lovely surprise waited for me upon my arrival in my hotel room: the Mini Bombette bag. 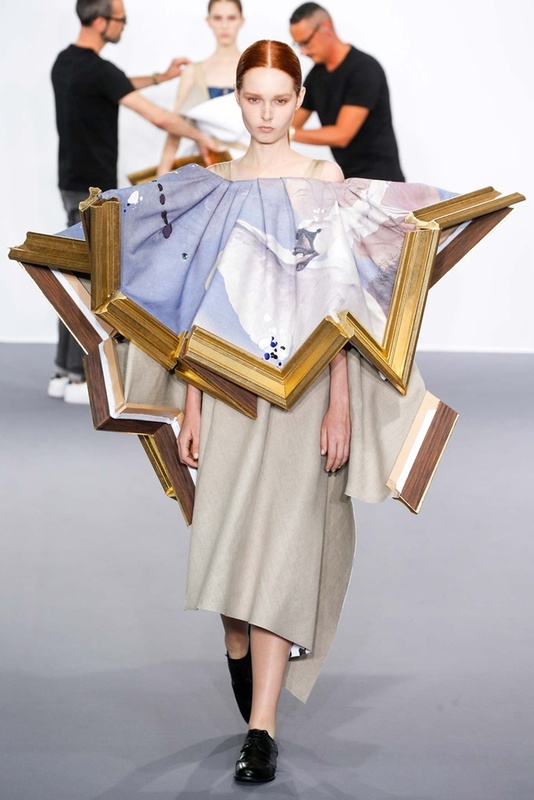 Viktor & Rolf surely cannot be pigeonholed. They are like the magicians of fashion for me and I am very curious to see their future projects and collections now that they can concentrate on their artistic skills. 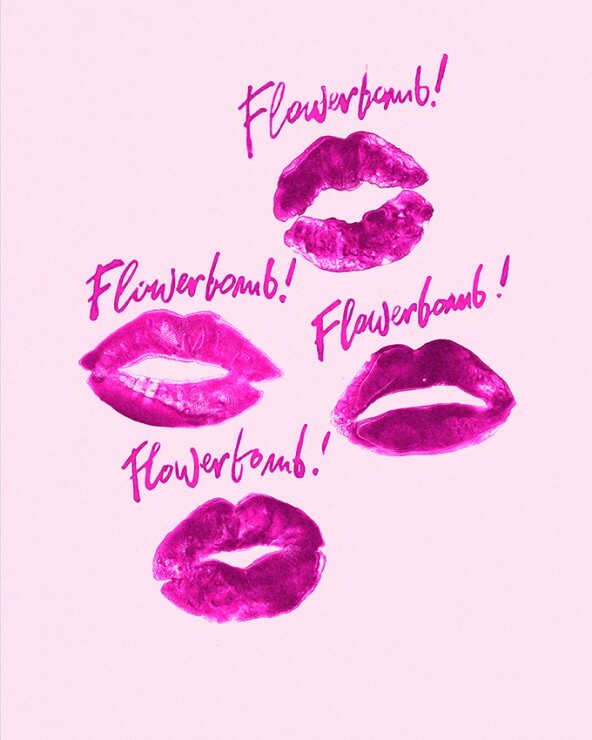 «Flowerbomb» is still growing a stronger audience and for the designer duo a good base to make most out of their business. Trust your heart, and success will come to you. In case of Viktor & Rolf, it absolutely seems to be true. 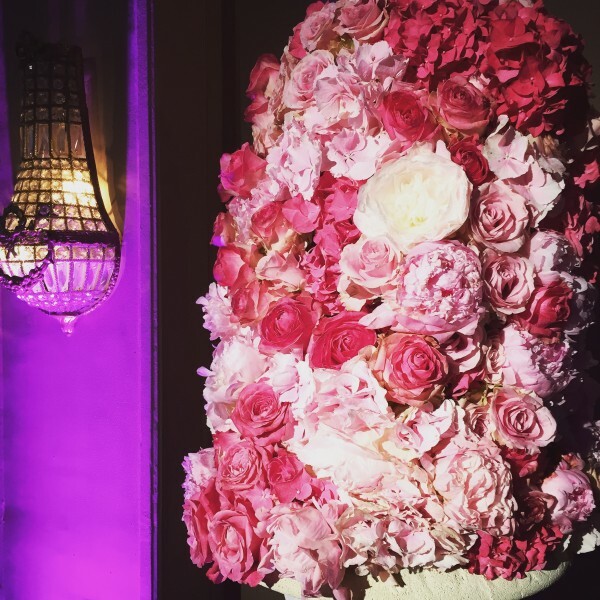 Happy Birthday Flowerbomb – what a great «flowerbombastic» party! 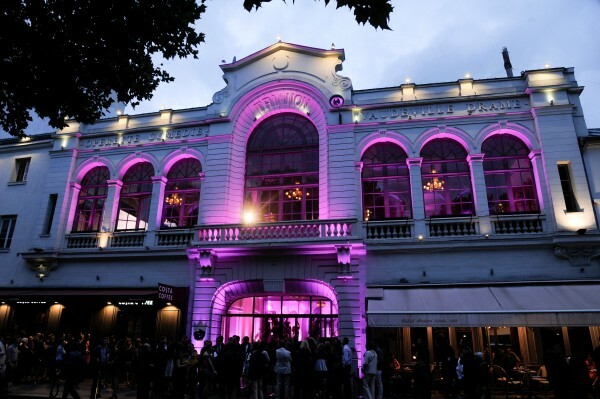 The house of Viktor&Rolf celebrated the 10th year anniversary of their iconic scent at Le Trianon in Paris in the beginning of July with a very special evening. The rooms were literally filled with thousands of flowers. 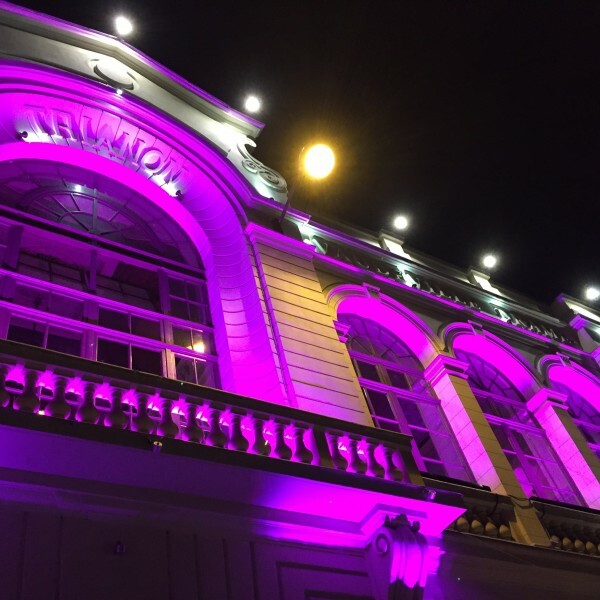 Highlight of the night were the outstanding performances by Tori Amos and Charli XCX. Enjoy all my pictures and stay tuned for the amazing interview I did with the designer duo. Designer duo Viktor&Rolf at their party. 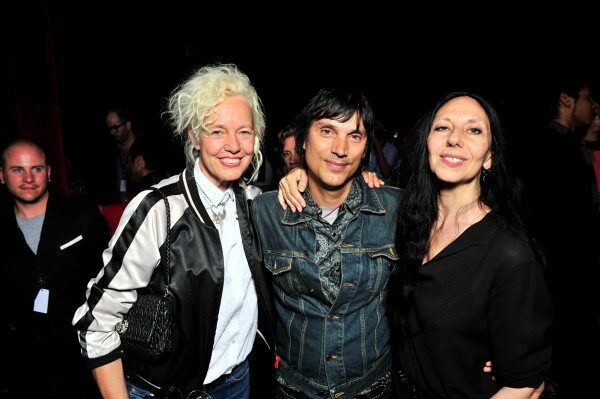 Ellen von Unwerth with photographer duo Inez Van Lamsweerde and Vinoodh Matadin. At the party with model Willy Cartier. … and in a stunning Viktor&Rolf dress upon arrival. 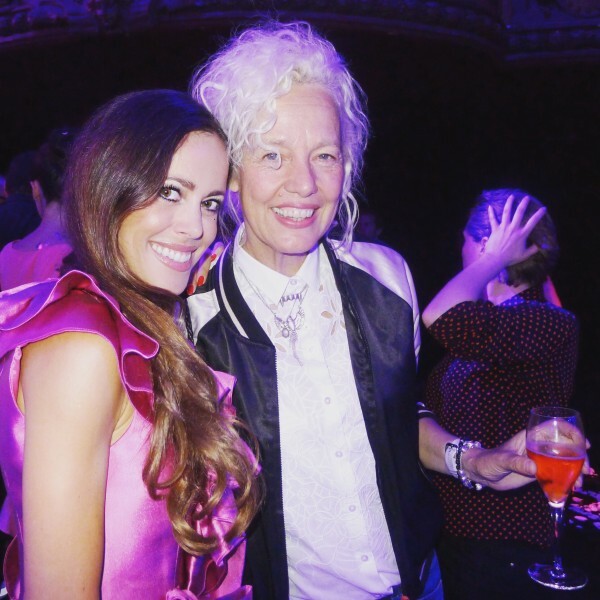 Ellen von Unwerth with me. Italian clothing magnate Renzo Rosso, President of OTB Group, the holding group, that bought a controlling interest in Viktor& Rolf in 2008. … and afterwards at the party with me. Finally we have some breaking fashion news again: John Galliano joins Maison Martin Margiela. The designer, who is regarded as one of contemporary fashion’s most outstanding talents, has been absent from the catwalks after he was fired from Dior in 2011 for allegedly making anti-Semitic remarks and assault (for the previous post, please click here). Galliano’s last collection for his eponymous label, shown in Paris in March 2011. The latest S/S 2015 Maison Martin Margiela collection, shown during Paris Fashion Week in September 2014. John Galliano is said to take over the design leadership of all Margiela lines, including couture and the women’s and men’s ready-to-wear collections. His first designs for his new home are expected to be seen in January during Paris Couture Week. 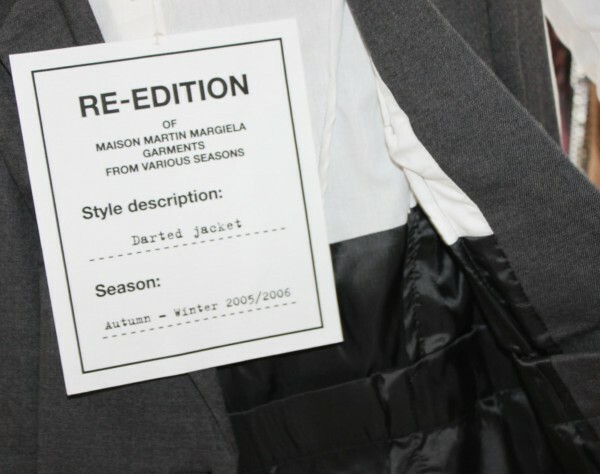 Martin Margiela retired in 2009 and an anonymous team continued his legacy. Even that Galliano doesn’t seem the most obvious choice, I think that he is absolutely capable to revolutionize the brand again. 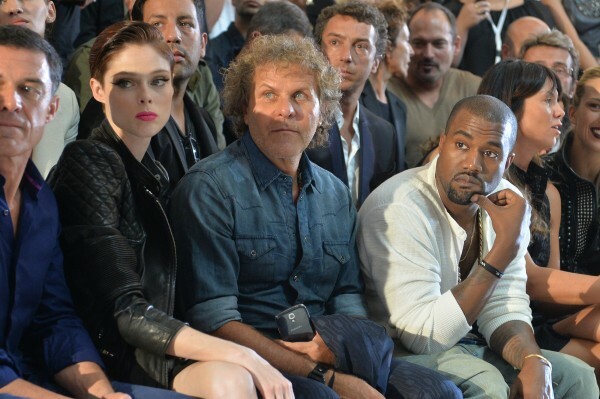 People have short memories, especially if Galliano delivers a desirable collection. Isn’t it easier to forgive than forget?! 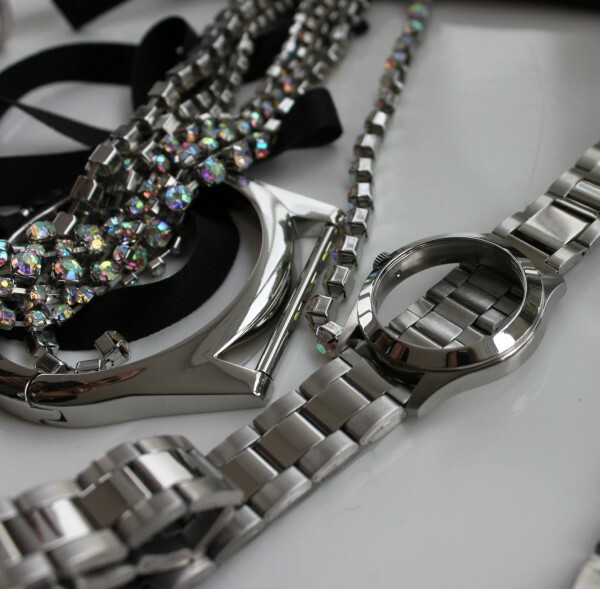 Let’s give Galliano a new lease on life… everyone deserves that! 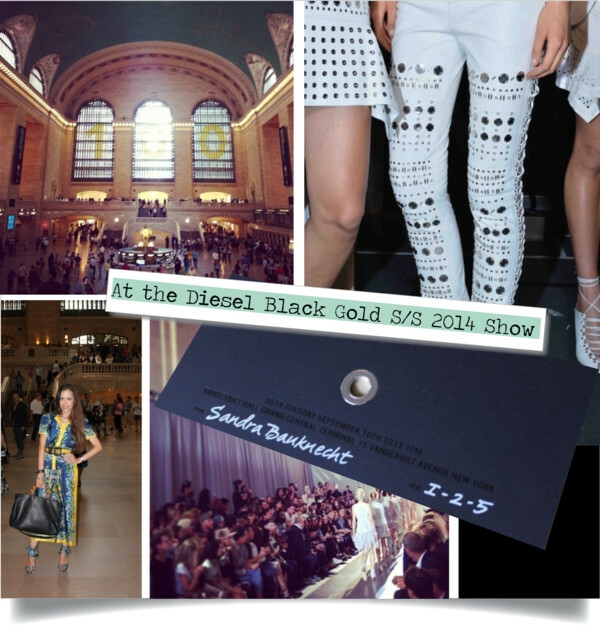 Last week, I attended the Diesel Black Gold S/S 2014 fashion show during Mercedes-Benz Fashion Week at Vanderbilt Hall at Grand Central Terminal in New York City, such an amazing location to host a runway presentation. For Andreas Melbostad‘s second season, he describes his inspiration like this: “A new ease of attitude by combining opposing icons to express strength and fearlessness”. The collection evolves its iconic staples to include a new, courageous fragility: metal eyelets, discs, zippers, buckles and hardware accents introduce luxe industrial elements, for a range of pieces, from leather to georgette. Lighter, softer materials – silk crepe de chine, silk georgette, cotton poplin, cotton voile – are juxtaposed against the collection’s utilitarian core of leather and denim. I love the jeans that come with a more slouchy fit at the hips and deep rolled cuffs at the ankle. 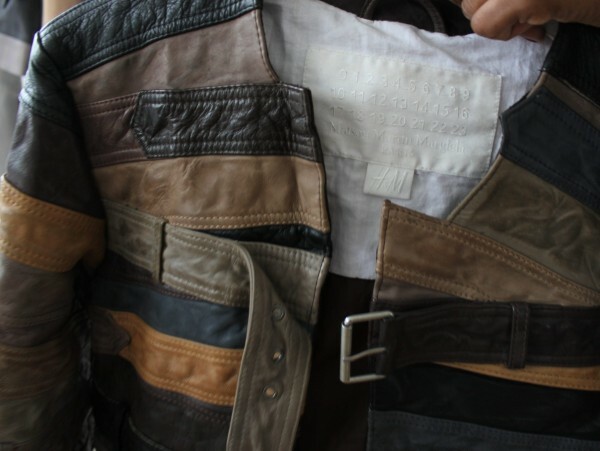 A pastel leather moto jacket will definitely be on my wish list. The only question is white, icy blue or baby pink? Designer Andreas Melbostad whom I met the first time this spring in Zurich (For the previous post, please click here please). Hell, yes! Diesel ignites yet another firestorm by appointing Nicola Formichetti, (Do you remember his first Mugler collection for F/W 2011 where Lady Gaga appeared on the runway? ), to be the commander-in-chief of the brave army that will spread Diesel’s marching orders far and wide. Starting with F/W 2013, the multifaceted, volatile, OTT stylist, designer and social media star will become the new artistic director of the lifestyle brand. Nicola Formichetti will start his new role with the DIESELREBOOT project now. 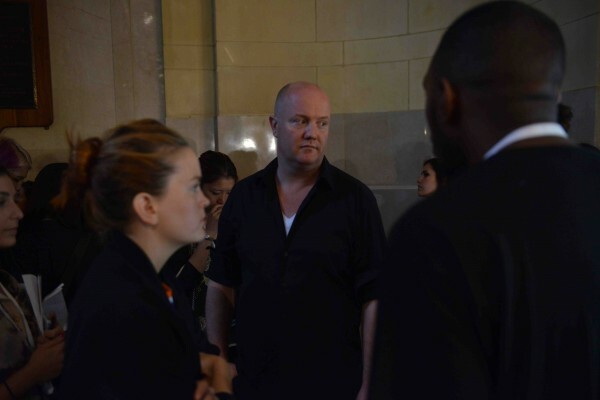 He plans to mobilize an emerging global creative community to collaborate with him. Check out www.dieselreboot.tumblr.com. Nicola will also oversee all creative activities of the main line, including the areas of product, communications and interior design. He will bring his own interpretation to the brand’s way of living – unpredictable, original, fun – coordinating the existing Diesel Creative Team and his new fresh recruits from different fields. 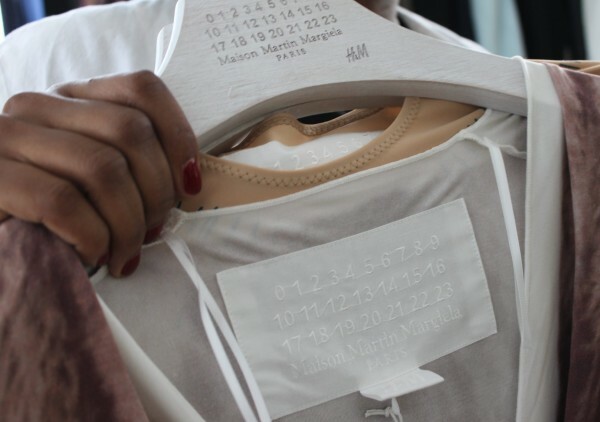 Here we go: Your exclusive preview of Maison Martin Margiela with H&M really up close! 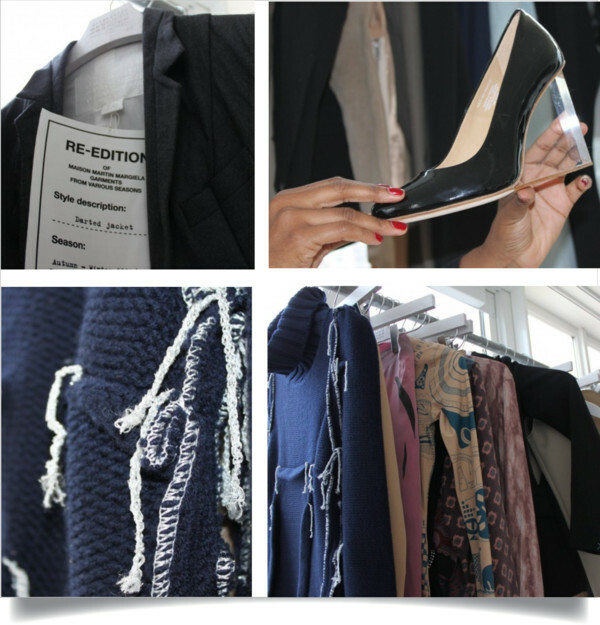 Today, I was able to browse through and try on the amazing collection at Mondrian Soho‘s penthouse suite. Personally speaking, I was truly impressed. Before talking you through the collaboration, let me tell you a little more about the house of Margiela: The influential Belgian designer Martin Margiela founded his brand Maison Martin Margiela in 1988. He is the fashion scene’s ghost, compared to other eccentric designers, he has never granted an interview or even considered to being photographed. His employees are wearing lab coats and have also never been seen in pictures. I met some of them today. You will see their white uniform in the photos but I am not allowed to show you their faces. 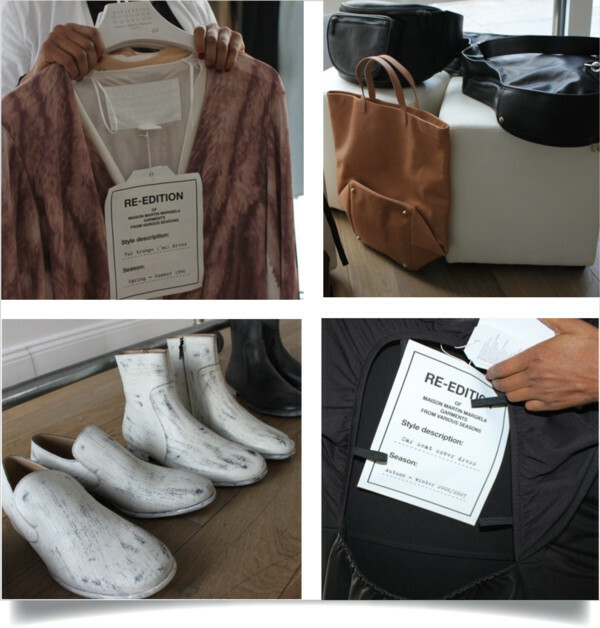 Margiela’s main focus is on the product and not on the individual behind it. The label on his clothes is equally anonymous, a blank white rectangle and a circled number from 0 to 23 that corresponds to one of various lines in the Margiela range. Of course, the white stitches used to affix his label—often visible at the back of the garment—have become funilly enough an internationally recognized icon. 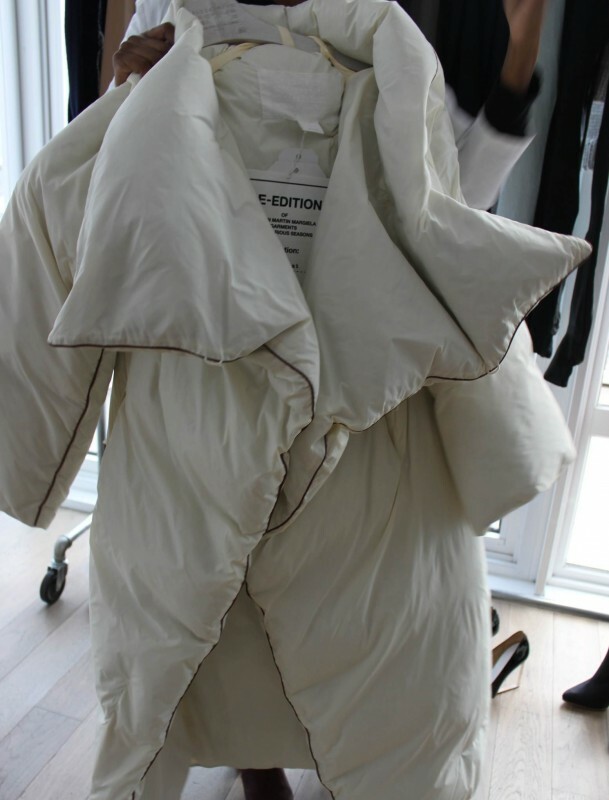 Margiela has pushed fashion boundaries with clothes made of trash bags or vintage home furnishings such as car seats or seat belts. In 2002, he sold a majority stake to Renzo Rosso, owner of Diesel. The collaboration between Maison Martin Margiela and H&M presents a re-edition of iconic Margiela garnets and accessories for men and women. It consists of around 100 pieces. Each of them is specifically labelled with a unique tag indicating the season from which it originated, spanning 23 years. The most representative pieces of Margiela’s archive are reproduced in updated shapes and materials and offered to the broad public as an exclusive synopsis of their history. 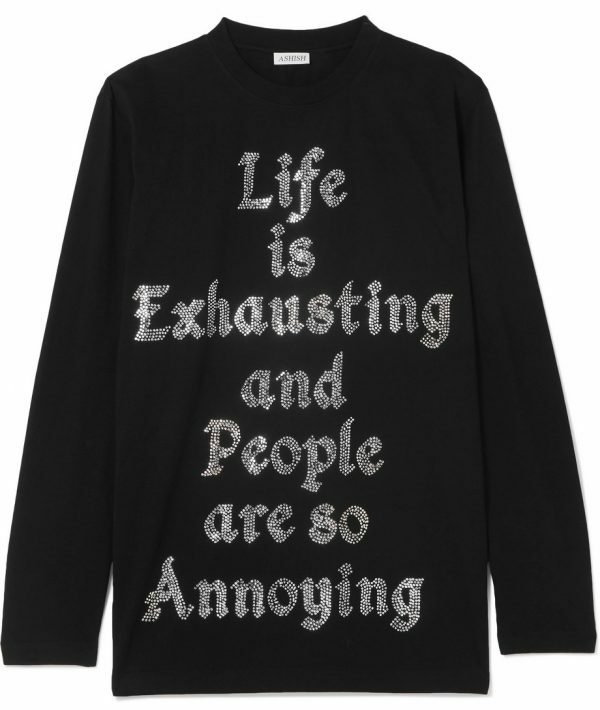 I think that is a very interesting approach of H&M. They are bringing fashion history to the masses which I adore. Shape & Volume: Masculine shapes are adjusted to frame the female body. 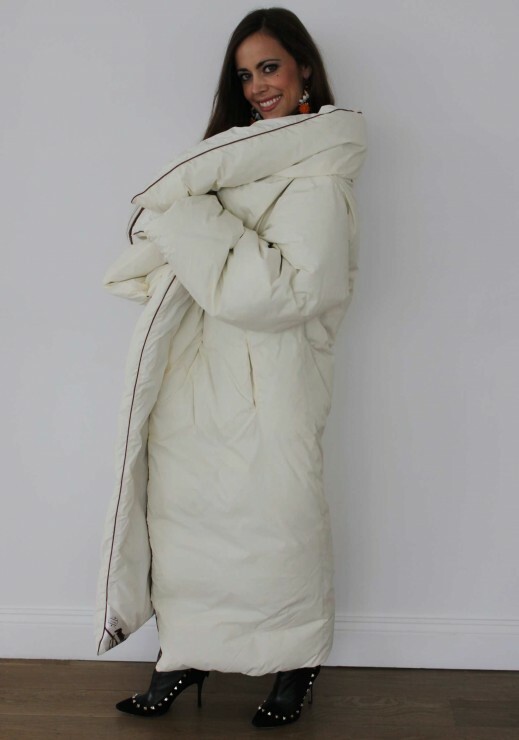 Oversized: Pieces of the masculine and feminine wardrobe are presented in oversized versions of themselves. Ambiguity: Conveyed through the use of trompe l’oeil. Transformation: This occurs in different ways. Offering a new use and shape to otherwise typical objects and materials. 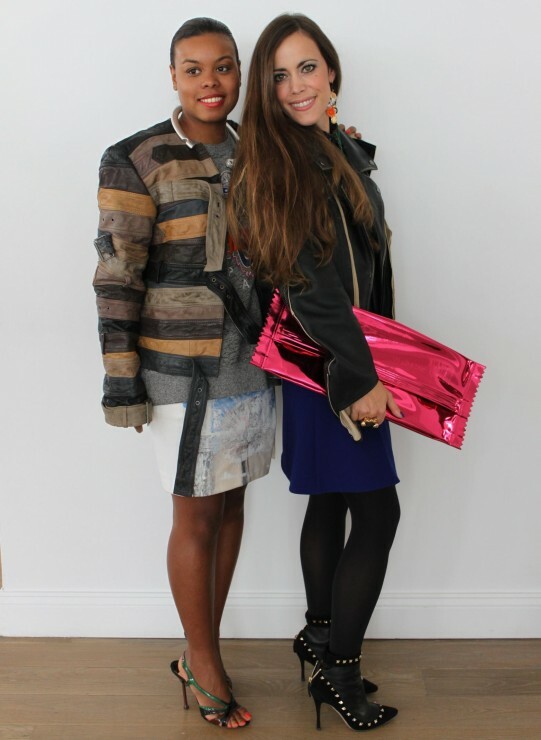 My favourites: The adjusted biker jacket and the amazing candy clutch in pink. The adjusted biker jacket for women also looks great on men as René sports it in perfection. If you like his style, follow him on instagram @renewho. Gray of Bootiesonmyfeet looks stunning in the belted Maison Martin Margiela with H&M leather jacket. The candy clutches SS2010. 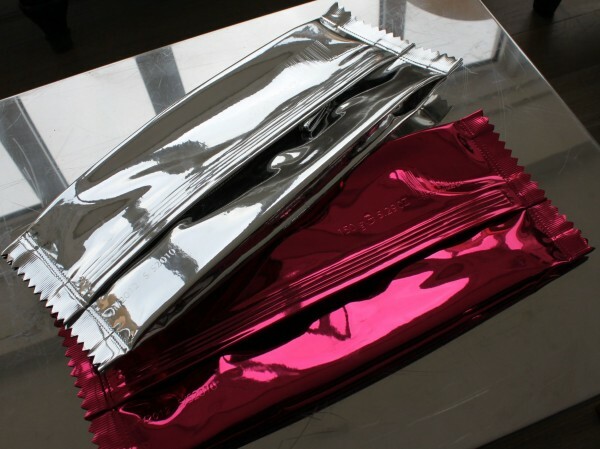 A candy bar packaging is enlarged and transformed into an evening clutch bag. 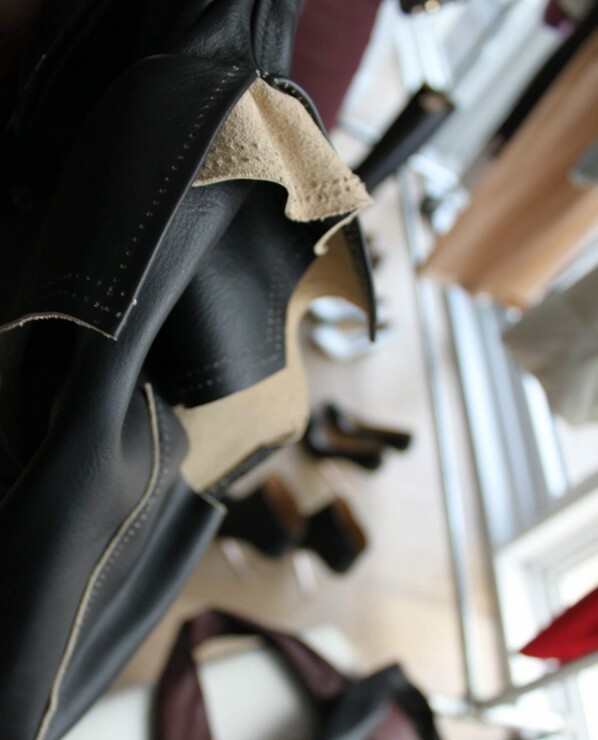 Process of Tailoring: Traditional finishings and tailoring procedures are visible. Similarly, more specific sartorial concepts, particular to the world of couture are exposed. The accessories are absolutely divine. Now, I am getting ready for tonight’s party where we can also shop the new collection before it will officially hit the stores on November 15, 2012 worldwide. 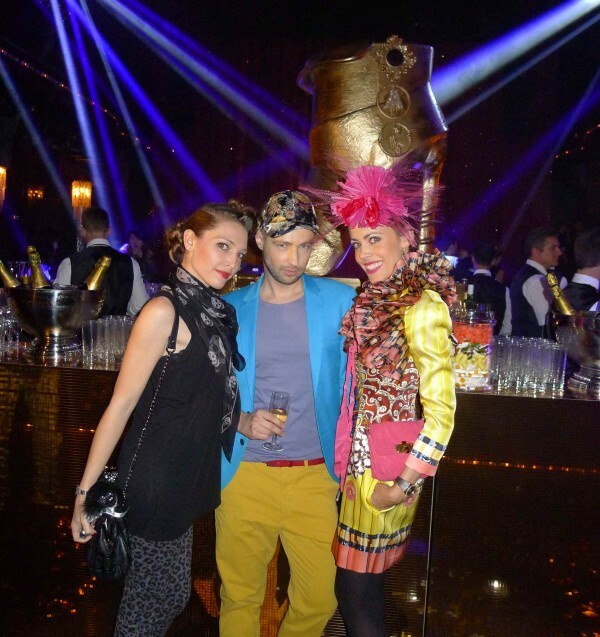 Thursday night, during Paris fashion week, an extravagant party launched the AdR at H&M collection with theatrical flair. 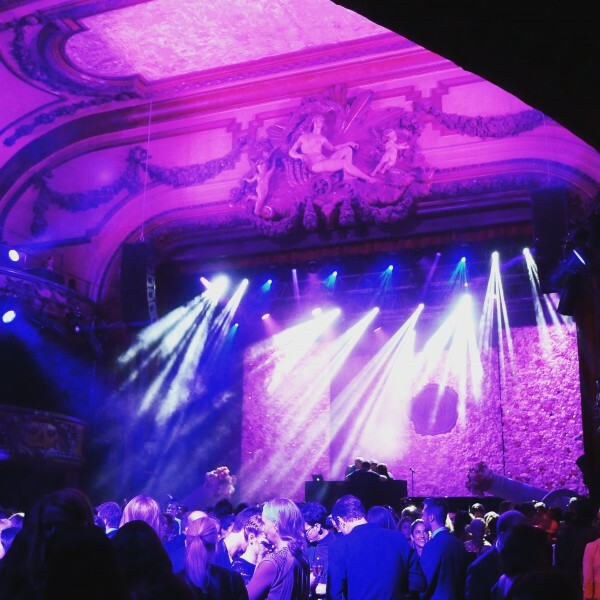 Hosted by H&M together with fashion icon Anna Dello Russo, the Paradise Ball took place in Paris famed cabaret nightclub Paradis Latin. 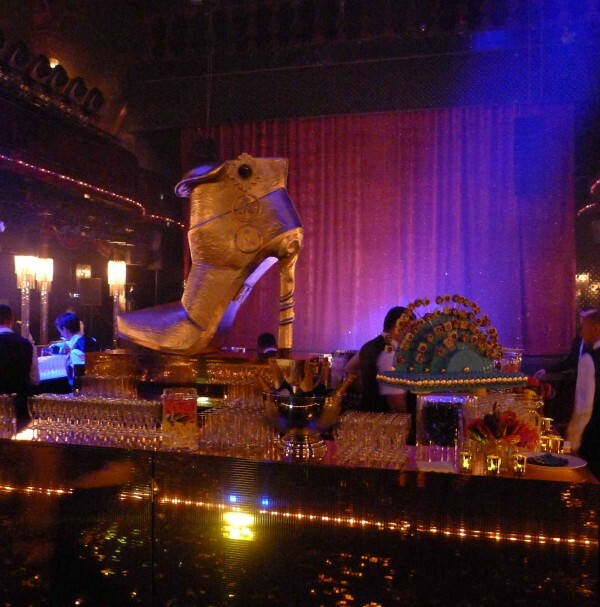 The glitzy party married fashion, performance and a live showcase by music star Azealia Banks. Staying true to AdR’s belief that fashion is something that makes you dream, the eccentric party was all about fantasy and decoration. “Excess for me means success”, said the fashion icon. 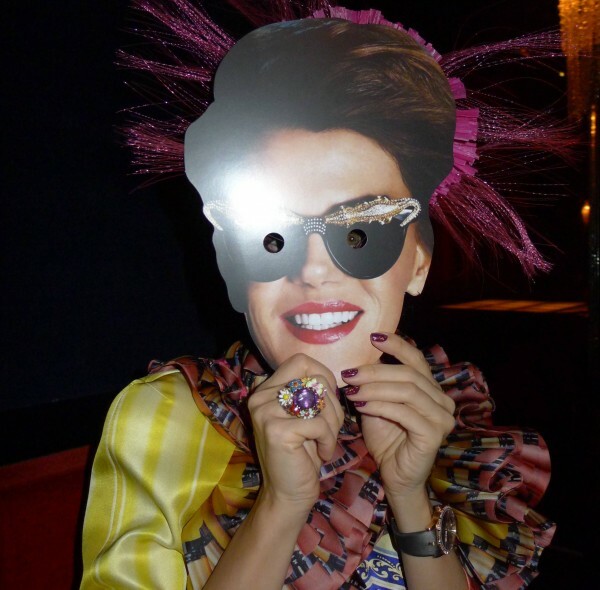 Wigs and paper masks transformed the fashionable crowd all into Mini-Annas. 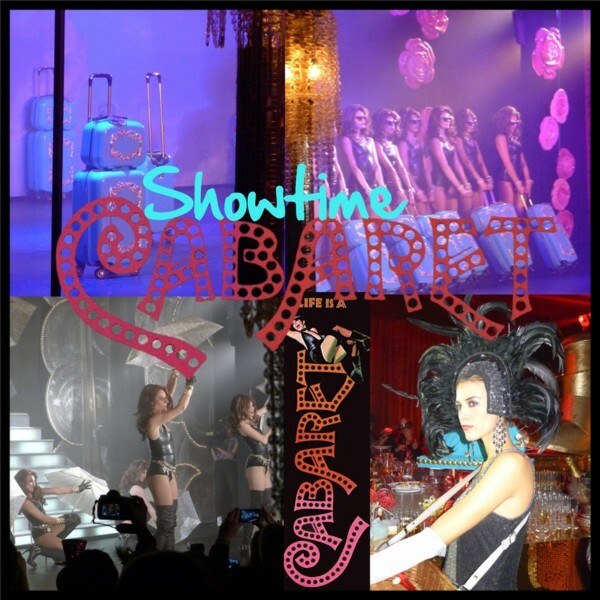 Cabaret-style “vogueing performances” as Anna described them, presented the collection in a very distinctive truly Parisian way. My look: Powder gun dress by Mary Katrantzou, head piece by Christian Dior, pink bag by Lanvin and Tribtoo textured leather pumps by Yves Saint Laurent. 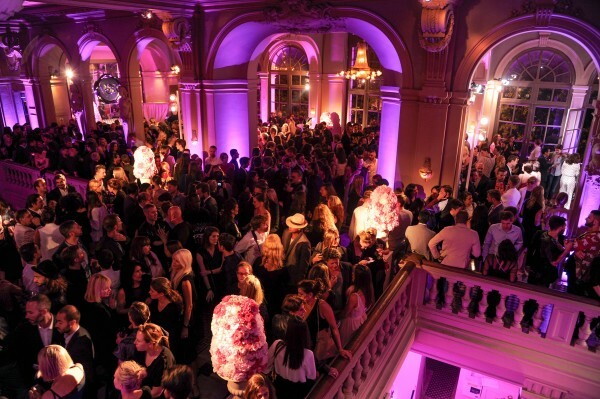 It was a very fun night, the Paradise Ball was such a glamorous way to launch such an eye-catching collection. 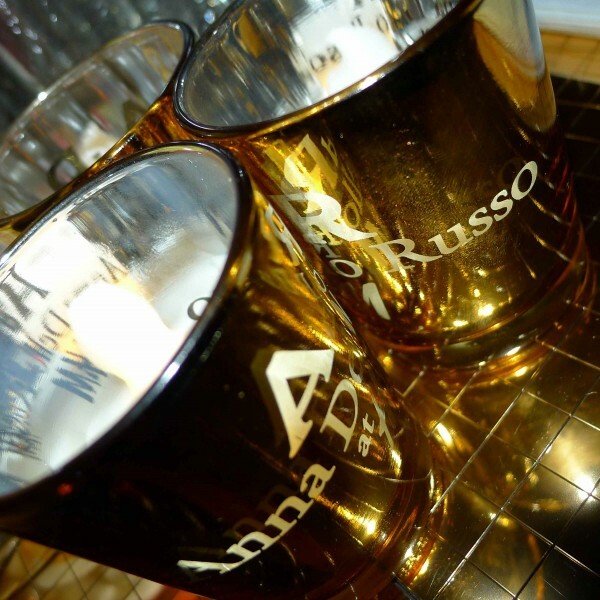 The playful line of jewelry, shoes and accessories that Anna Dello Russo designed for H&M, will be on sale from October 4, 2012, in 140 stores worldwide and online. Below are some of my favourite pieces.